For the past 30 years I have taught at a fairly large New England prep school in the Boston suburbs with an internationally diverse student body—co-ed—and both a boarding and day population. 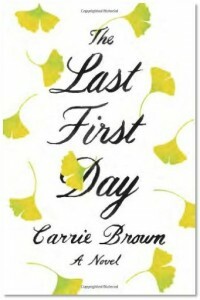 My experience is in many ways lightyears from that of Ruth van Dusen, the protagonist of The Last First Day. Ruth has been the headmaster’s wife for over 30 years at a fictional, rural New England prep school, Derry School for Boys. But in essence, especially in the evocation of the school as a community—the surface clubby congeniality of the faculty, a world unto itself, a Petrie-dish of emotions, aspirations, disappointments, petty ambition, and empire-building—it is the same. As another school year is launched Ruth prepares (as she has done for all these years) for welcome back faculty, party at their home—the headmaster’s house—scenes from her severely troubled childhood, courtship, and marriage flash through her mind. Ruth’s husband Peter is the wise captain who has kept the school afloat through financial storms and social upheavals with a gracious demeanor and boundless tact. They have no children. They are both aware that Peter—growing visibly older and afflicted with a rare illness—will soon lose his tenure and make way for a younger, more “modern” leader, one more in sync with the changing world of educational mores and innovative technology. Ruth, at turns angry and sad, faces the loss of what she could have been if she had not willingly if reluctantly, subsumed her life into that of her husband and the school itself. Carrie Brown utilizes the literary flashback device to an almost alarming degree as we move ever so slowly with Ruth through her catering preparations and her evening marking the van Dusen’s last opening of school. This is a meandering novel not in a hurry to tell its tale. This nostalgic (maybe overindulgent) tale almost drowns under the slow, torpid flow of scenes; but we can relish the sensitively evoked detail, like a Vermeer painting, depicting the curves and sandbars of youthful love and then a long union. These are the driftwood and detritus washed up on the banks of a relationship in which both partners know one another too well and (from Ruth’s perspective) often not at all.